Wellington, April 3: New Zealand opted for experience in a 15-man squad named Wednesday for this year's cricket World Cup, with rookie Tom Blundell's inclusion as back-up wicketkeeper the only real surprise. The Black Caps hope to shed their tag as valiant losers and claim the title after exiting in the semi-finals six times and suffering a heavy defeat to Australia in their only appearance in the final four years ago. New Zealand are currently third in the one-day rankings, behind England and India. Coach Gary Stead said the Kane Williamson-led side had repeatedly excelled at the top level and he was confident the consistency would shine through at the tournament in England and Wales. 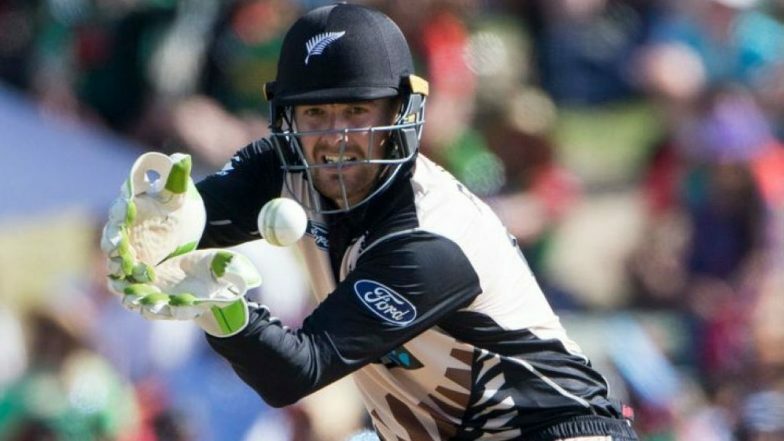 New Zealand Squad for ICC Cricket World Cup 2019: Here’s a Look at Kiwis’ Expected 30-Man Players List for the Mega Event in England. "We've got a squad here of 15 players that we think can give us a really, really good chance of going far into the tournament," he said. "If we play close to our potential, then hopefully we can do New Zealand proud." Wellington keeper Blundell was selected after Tim Siefert, the regular back-up to first-choice gloveman Tom Latham, broke his finger in a domestic match last month. While Blundell, who has two Test caps, will likely make his one-day international debut at the tournament, his role will be marginal if Latham stays fit. Mitchell Santner will be the New Zealanders' primary spinner, with Ish Sodhi edging Todd Astle to claim the second slow bowling position. "(Selecting) the spinners was very tough, and both had signs at times that they should've been the one that was selected... but at the end of the day that's my call to make," Stead said. The pace attack comprises Tim Southee, Trent Boult, Lockie Ferguson and Matt Henry, while Jimmy Neesham and Colin de Grandhomme add all-round options. ICC Cricket World Cup 2019 Schedule in PDF: Ticket Prices, Dates, Venue Details & Timetable Available for Download Online. Henry Nicholls is set to open the batting with veteran Martin Guptill after displacing Colin Munro at the top of the order, although Munro will make the trip as batting cover. Williamson and Ross Taylor, in his fourth World Cup campaign, complete a battle-hardened batting line up. Williamson, Taylor and Guptill have collectively amassed 526 ODI appearances between them. Guptill and Taylor have not confirmed their post-tournament plans but will most likely be looking to exit cricket's biggest stage on a high. The Black Caps will open their campaign against Sri Lanka in Cardiff on June 1. New Zealand: Kane Williamson (capt), Tom Blundell, Trent Boult, Colin de Grandhomme, Lockie Ferguson, Martin Guptill, Matt Henry, Tom Latham, Colin Munro, Jimmy Neesham, Henry Nicholls, Mitchell Santner, Ish Sodhi, Tim Southee, Ross Taylor.